On a cold and rainy winter morning in 1976, a rusty twenty feet-container was being unloaded on a dark quay in Southern England. Most extraordinary the container sheltered wooden boxes with Indian motorcycles from Madras Motors, South India. On the face of it, it seems bizarre to import Indian motorcycles to a country like England, but in fact they soon managed to arouse interest in the many lovers of the traditional British single. Actually it was not at all an unknown Indian motorcycle the container held, but a motorcycle which was as British as anything... a 1955-model Royal Enfield Bullet from the Golden age of the British motorcycle industry. These 1955-bikes, however, had just recently left a factory in Madras: They were simply brand new. The only thing that apparently differentiated the Indian-produced motorcycles from the original British 1950-motorcycle, was the very name: Now the tank read Enfield and the tool boxes Indian Enfield. For several reasons the first import by the Slater brothers of the Enfield India 350 cc with the container in 1976 proved not to be especially successful, but in the eighties the Bavanar Products of Surrey took over the import with the slogan: 'The Practical Classic you can ride with pride'. Now Enfield India Bullets were sold by the hundreds in England and a great number reshipped to other countries in Europe, which by now had discovered the return of the charming classic. 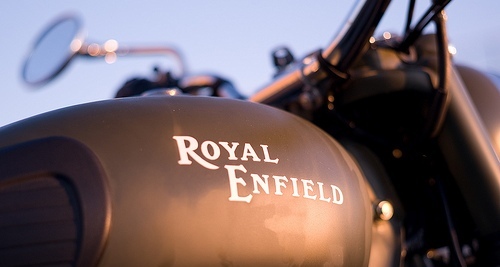 Royal Enfield Motors Ltd. in Chennai, Tamil Nadu, India, the manufacturer of the Royal Enfield Bullet produces more than 30.000 motorcycles annually. The Bullet is being exported to more than twenty countries. And the offical name of the Indian-produced Bullet is again Royal Enfield Bullet - some years ago the factory acquired the rights for the name. There is a certain irony of fate in the fact that the Royal Enfield now is being exported to Japan - thirty years after the time when the cheap Japanese motorcycles dealt a death blow to the British motorcycles industry. In the US and UK the demand for Bullets is growing fast these years. In the US about 500 Bullets are sold annually and expectations regarding sales for 2003 on the UK market is more than 700 units. The story of the return of the Royal Enfield Bullets in Europe is interesting, but what lies behind? How does it come about that a traditional British one-cylinder motorcycle is being produced in India today? beginning of the conflicts with Pakistan to find the answer. The Indian army needed a reliable motorcycle suitable for the patrolling of the mountainous frontier regions, and, after careful consideration, the allready then legendary Bullet was chosen. At a certain point the Royal Enfield factory in Reddich could not comply with the extensive orders of the Indian army, and, in collaboration with Madras Motors they decided to set up a sister factory in South India which was to be supervised and controlled by the factory in Reddich and equipped with British tools. In the beginning of the fifties the first Indian Enfield rolled out of the factory in Madras and soon after the production of motorcycles for civilian use - still based on the 1955-model - was implemented. A production which fortunately never came to an end. Since then, for almost fifty years, the Indian home market has appreciated the very virtues that characterize a British motorcycle of the postwar period: reliability, simplicity of contruction, and fuel-efficiency. During the first years the contact with the mother factory in Reddich was close, but after a while the Indian production apparently was more or less forgotten and in 1971, after several attempts at saving the British factory the production of Royal Enfields came to a definitive end. But then again, only five years were to pass before the Royal Enfield Bullet - with the container of the Slater brothers - returned to England from India.